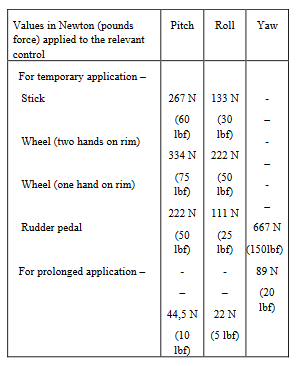 How much physical strength is required to control a Cessna 172? I have heard a number of folks tell me that one needs a certain amount of physical strength to be able to control the Cessna 172. Is that true? I'm flying sims now, just wanted to know. I will take this from a more general perspective. A Cessna 172 is part of the CS-23 category (in EASA land, see the equivalent Part 23 for FAA land). In the relevant document, point CS 23.143, we find the maximum forces a pilot might be required to exert on the control columns so that the aircraft can be certified. It depends on what you mean by "strength". In general, it is "not much". I've flown a lot of sims and also flown a real Cessna 172. It is true that most sim controllers (especially joysticks) require almost no effort to move at all. In that perspective, then yes, flying a real airplane takes some strength, especially if you compare the force required to achieve max deflection (not recommend in flight!!!). The flight controls of a light aircraft are still light enough that a healthy adult can manipulate them very easily. In fact, the correct technique is to use two or three fingers on the yoke. Most first-time students grab the yoke firmly in their hands, this is wrong because you cannot feel the airplane. If one has the strength to drive a modern-day road car, one can certainly fly a light airplane. I have also spent some time in a B737 training simulator (not PC simulators - I mean the real sims used for training). I was surprised to find the controls much heavier. I would describe the feeling as solid and fluid. They are still easy enough to manipulate such that my mind can focus on elsewhere instead of the physical movements of the control. I've never flown a 172, but I fly a Piper Warrior which is in the same ballpark. You definitely need to apply a lot more force than with a flight sim yoke and provide positive pressure (Remember, you're fighting the airflow ultimately), but you don't need to be "strong". I'd imagine anyone who can drive a car would have the strength to fly a plane. Remember, most flying is one handed and most pilots will use their less-dominant hand (Left hand) so it can't be that bad! I do find the Warrior needs a lot of backpressure to rotate and flare. So, at 100kts that's 16lbs / 7kgs. I taught people of all sizes to fly for about 30 years. I taught my commercial students how to take off and land without even touching the yoke. So it is possible to control a c- 172 with no yoke force whatsoever. Just rudder, throttle and trim. So by the use of proper trim use, one can control the aircraft using the yoke with only ounces of force. Don't let people discourage you. I have several hundred hours in a 172, while it's a bit heavier on the controls than a 152 it isn't much. If you have normal movement then you can likely fly a 172. A benefit to control force in real aircraft vs Sims is the feedback you get through the controls with renders Sims largely ineffective in many cases. OK for some stuff mostly instrument related but it will never replace actual flying. The 172 was a lot easier to fly than the turbine modified Grumman Goose I flew, that thing was like trying to fly a dump truck with manual steering. The amount of physical exertion required while flying a 172 depends largely on what you're trying to accomplish; for example, cruising in a trimmed attitude requires almost no effort whatsoever. However, purposely inducing an aggravated stall/spin action then recovering requires considerably more effort. Since recovering from all situations is important while flying as a PIC, one should give it a try before pursuing training in earnest. Personally, the most exertion required is climbing up to manually check the fuel levels in the wing tanks. But once I got the hang of it, it became quite easy. I fly both Cessna and piper aircraft. The flight controls on a 172 require a lot less force. The flight controls on a piper feel much heaver..you feel like your flying a much bigger airplane. So to answer your question it does not take a lot of strength to fly one. Not the answer you're looking for? Browse other questions tagged flight-controls cessna-172 or ask your own question. Why did Cessna get rid of manual flaps in their 172? Do you need strong muscles as far as applying the yoke is concerned, in order to be able to deal with some emergencies? What are design or functional differences between sticks and yokes? Is a smartphone required to control a DJI Phantom 2 Vision+? Cessna 172/182: Should I set the tank selector to the R.H. tank after parking the airplane? How many aluminum panels on the top of a 172M wing from 1972? Is there anything extra required to spin a Cessna 172 in the Utility category? Cessna 172: at which RPM should the oil pressure reach the green arc? Does currency in one C172 model apply to other models?